If you recognise the RME brand, you’re probably an audio professional. The German company specialises in digital audio solutions, primarily targeting the pro audio industry. However, there is a fringe of home audio enthusiasts that has discovered and started using RME’s products. Recognising that there may be some opportunities in this crossover market, the company is producing some pro-standard products specifically for home use. The ADI-2 DAC is a case in point. It’s based on the ADI-2 Pro, with the major difference being that the Pro includes analogue-to-digital conversion. However, the DAC retains the Pro model’s superior build quality, and its fully balanced, symmetrical circuit topology. The DAC moniker itself is somewhat of an understatement. Yes, the ADI-2 is a DAC, but it’s also a highly competent and powerful headphone amp – good enough for highly critical studio monitoring purposes. In true pro audio fashion, the device also offers a level of customisation that’s streets ahead of any conventional hi-fi component. That customisation may by definition be too complex and unintuitive for some, but highly attractive to others. It all depends on your requirements, and to what extent absolute accuracy is a priority. Superbly built and presented, the ADI-2 DAC is a compact, half-width component that will easily find a home on a desk, as opposed to an equipment rack. The look is functional rather than conventionally pretty, but not unattractive – another typical pro attribute. The front panel layout is deceptively simple with a soft-touch power button, a generous IPS high-res colour display, a large turn-and-click rotary controller flanked by four function buttons, and a pair of smaller rotary controllers on the far right. The colour screen can be switched off for users who find it distracting, but it provides a host of useful information, including peak level readings, a 30-band spectrum analyser, volume and system status information, and more. The control interface uses a series of menus and submenus navigated by the switchgear provided. It’s reasonably logical once you understand the underlying operating protocol, albeit more complex and less intuitive than your typical hi-fi component. There is a compact remote control with basic functionality, plus four programmable keys, which will be useful to those intending to use the RME in a hi-fi setup. Of particular note are the two headphone outputs – a standard 6,35 mm headphone socket, and a 3,5 mm minijack socket specifically designed for in-ear monitor use. Each gets its own, bespoke amplifier, but the latter has different gain setting to compensate for the typically higher sensitivity of IEMs, with a lower noise floor to match. The output stages are extremely robust, and offer exceptionally low THD values, as well as the ability to drive high-impedance headphones effortlessly. Add a 120 dB signal-to-noise ratio, and headphone (and IEM) fans will be in audio heaven. The rear panel provides further insights into the DI-2 DAC’s capabilities. In addition to the expected USB 2.0 Type B socket for hooking up a computer, both coaxial digital and Toslink optical digital inputs are provided. Surprisingly, given its pro origins, there’s no AES/EBU XLR input – possibly to save costs. There are also two line output sets – one balanced XLR, one line-level RCA – to allow the REM to be incorporated into a conventional hi-fi system, as opposed to being used for headphones only. Those line outputs are muted when headphones are plugged in, however. Both the RCA and XLR line output levels are adjustable in four steps to allow for more accurate system matching when the RME is hooked up to a home audio system. As mentioned, one of the key attractions of the ADI-2 DAC is its configurability. Specifically, there’s a five-band parametric equaliser with preset memories. For less precise, rapid tone control, bass and treble can be adjusted up to ±6 dB. For low-level listening, there’s an advanced, adjustable loudness control. Also, the AKM AK4490 DAC chipset offers six of different oversampling filters. The chipset operates at sampling rates up to 768 kHz at depths of up 32 bits, while an internal clock delivers top-class accuracy and jitter suppression. Once set up, all the parameter settings can be stored – and the ADI-2 has nine memories, allowing rapid swapping between different adjustment sets. That’s particularly useful if the ADI-2 DAC is being used for different applications: different headphones, for instance, or when linked to an audio system, etc. For a complete run-down of the ADI-2 DAC’s almost overwhelming feature set and options, you can visit the RME website . The very comprehensive manual is also available for download from the site. Sonically, the ADI-2 DAC places the emphasis squarely on neutrality and accuracy – and that’s not surprising, given its pro audio heritage. That said, the digital filters and parametric equalisation, as well as the tone control allow the sound of the DAC to be tailored to suit room conditions, system limitations, and personal preference. The whole concept of the ADI-2 DAC revolves around accuracy, linearity, ultra-low noise superior signal-to-noise ratios. Using my Sennheiser HD800 headphones, with the source signal provided via a MacBook Pro running Roon via USB, the sound was open, airy and spacious. Yes, adjectives like precise and revealing do come to mind, together with an effortlessness, despite the Sennheiser’s high impedance. Sonically, the RME tells it like it is, warts and all, so that it rewards a good source signal, and ruthlessly reveals flawed ones. Compared to my PS Audio DirectStream hi-fi DAC, the RME sounded leaner and cleaner, with a comparably open soundstage and excellent dimensionality. It resolved a higher degree of fine detail, but lacked some of the PS Audio DAC’s emotive appeal, sounding somewhat stark and unforgiving. 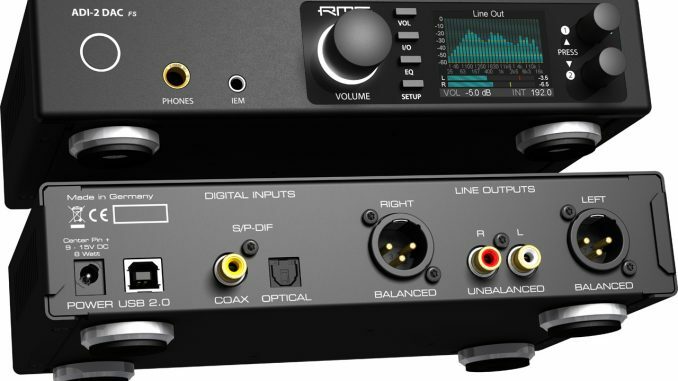 At just short of R30,000, the RME ADI-2 DAC is expensive. But it is a serious piece of kit, with a features set miles ahead of conventional, hi-fi orientated DAC/headphone amp combos, and a level of performance that underscores its pro audio pedigree. It’s not for everyone, but if uncompromising accuracy and extensive configurability, as well as versatility and superb execution are top of the priority list, the RME Audio ADI-2 DAC fits the bill perfectly.